Happy New Year to every Saturn fans out there! Otamajakushi is a little game developped by CRI in 1997. 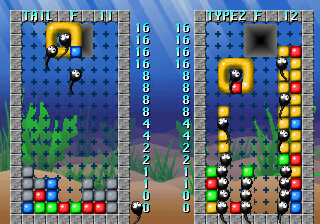 This is a Tetris-like with tadpoles (Otamajakushi means Tadpole in Japanese). - Nitezume mode which is a puzzle mode where you need to free the screen in a limited number of drops. The manual is included in .BMP files. This game was available in a Japanese Sega Saturn demo disc and I thought it will be great to make a standalone release of it. I could make more releases in the future if this one gets some interest. See you soon with a major update to the database. Gracias vbt, tú y madroms haceis un gran trabajo por la Saturn. Se agradece, de verdad.